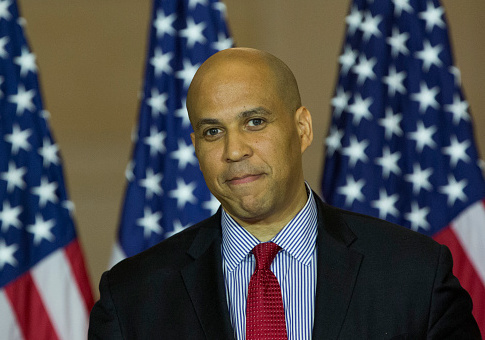 Cory Booker has a history of opposition to Monsanto during his tenure in the U.S. Senate, but he is leaning on a long-time former lobbyist for the agribusiness giant to show him around Iowa while laying the groundwork for what looks like a future presidential run. The Associated Press took notice this week of Booker working "overtime" in the Hawkeye state. "Adding to the intrigue surrounding Booker is his budding relationship with Des Moines lawyer Jerry Crawford, a party powerbroker helping the senator make connections in Iowa," the AP reported. "After Crawford attended a dinner with Booker in the Washington area last spring, he arranged meetings in Newark for him with influential Iowa Democrats, including state House Minority Leader Mark Smith." Crawford is not currently lobbying for Monsanto, but the senate lobbyist disclosure database shows he has done work for the company dating back to 2009, and ended the work in the first quarter of 2017. In recent years, the junior senator from New Jersey has been critical of Monsanto with his tweets, rhetoric, and legislation. Booker introduced a bill in late August that would "put an 18-month moratorium on large agribusiness, food and beverage manufacturing, and grocery retail mergers and acquisitions." The bill was introduced shortly after the Department of Justice approved a merger between Bayer and Monsanto. Before that, Booker was among a group of Democratic senators who urged the Department of Justice to "conduct a thorough and impartial analysis of Bayer AG's proposed $66 billion acquisition of Monsanto Company." In a 2017 confirmation hearing for an appointment to the Environmental Protection Agency, Booker grilled the nominee for his work with a company that made toxicology risk assessments and recommendations. Booker said he came from a community "that has seen the effects of corporate villainy," and laid out his theory of how the nominee's company was complicit in bad behavior, saying, "first a company or industry identifies a problem and you've already talked to Dow and Monsanto and chemical companies like this and they want to exercise influence to stop safety measures being done by governments." Crawford told the Washington Free Beacon that his former lobbying for Monsanto has been immaterial to his current relationship with Booker. "I am not currently a lobbyist for Monsanto," Crawford told the Free Beacon by email. "I have been off and on for many years. I have never spoken to Senator Booker or any other Member of Congress about the pending merger. The topic of Monsanto has never come up." Crawford also said he had never spoken to any member of Booker's staff about Monsanto. A request for comment to Booker's office was not returned. This entry was posted in Politics and tagged 2020 Election, Cory Booker, Iowa. Bookmark the permalink.